By the time of the excellently titled “Final Ripper”, your world will not have been changed, new dimensions of aural possibility will not have been opened up to you, but you will have heard a fine retro record, filled with good riffs and 100% commitment. OK, here we have a band pushing the boundaries of modern art, with no references to the past and a completely new take on rock and metal. Ah, actually... no we don't. They are called Black Wizard; what do you THINK they sound like?! You would be right; this is pure retro doom/metal/rock. Think Sabbath, Purple, Pentagram and then more modern throwbacks like Witchcraft. Hailing from Vancouver, the band have crafted a perfectly listenable record along with lines of all bands mentioned (and many bands not mentioned) thus far. Please note, from the live sounding drums, swirling Hammond organ and well delivered vocals there is absolutely nothing new here. However, that is not to say that this is not worth your time. The likes of the opener “Revival” (apt) and “Laughing and Lost” deliver deep grooves aplenty, as well as some fine riffing and good production tricks. Black Wizard are derivative, I don't think they would even try to dispute that, but they are also pretty good. The pace is often faster than you might expect from their name and the band play well consistently. The whole album both swings and rocks, which is no mean feat. You may have heard the riffs, beats and bass lines before, but that does not mean you don't want to hear them again! There are mellower moments, such as “Waiting For”, as well as straight ahead rockers like “The Priest” (which is a great track). By the time of the excellently titled “Final Ripper”, your world will not have been changed, new dimensions of aural possibility will not have been opened up to you, but you will have heard a fine retro record, filled with good riffs and 100% commitment. 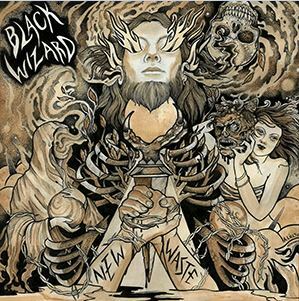 Black Wizard would be a fine support act for any band from Electric Wizard to Pentagram to Uncle Acid. And there is a great deal to support that endorsement to be found herein.